In this article, we will learn how to implement a Feedforward Neural Network in Keras. We will use handwritten digit classification as an example to illustrate the effectiveness of a feedforward network. We will also see how to spot and overcome Overfitting during training. MNIST is a commonly used handwritten digit dataset consisting of 60,000 images in the training set and 10,000 images in the test set. So, each digit has 6000 images in the training set. The digits are size-normalized and centered in a fixed-size ( 28×28 ) image. The task is to train a machine learning algorithm to recognize a new sample from the test set correctly. For a quick understanding of Feedforward Neural Network, you can have a look at our previous article. We will use raw pixel values as input to the network. The images are matrices of size 28×28. So, we reshape the image matrix to an array of size 784 ( 28*28 ) and feed this array to the network. We will use a network with 2 hidden layers having 512 neurons each. The output layer will have 10 layers for the 10 digits. A schematic diagram is shown below. Check out this post if you don’t have Keras installed yet! Also, download the code from the link below to follow along with the post. Let us dive into the code! Let’s see how the data looks like. The data consists of handwritten numbers ranging from 0 to 9, along with their ground truth. It has 60,000 train samples and 10,000 test samples. Each sample is a 28×28 grayscale image. The images are grayscale and the pixel values range from 0 to 255. We will apply the following preprocessing to the data before feeding it to the network. Convert each image matrix ( 28×28 ) to an array ( 28*28 = 784 dimenstional ) which will be fed to the network as a single feature. Convert the data to float and scale the values between 0 to 1. Convert the labels from integer to categorical ( one-hot ) encoding since that is the format required by Keras to perform multiclass classification. One-hot encoding is a type of boolean representation of integer data. It converts the integer to an array of all zeros except a 1 at the index of the integer. We have described the Keras Workflow in our previous post. The block diagram is given here for reference. Basically, once you have the training and test data, you can follow these steps to train a neural network in Keras. We had mentioned that we will be using a network with 2 hidden layers and an output layer with 10 units. The number of units in the hidden layers is kept to be 512. The input to the network is the 784-dimensional array converted from the 28×28 image. We will use the Sequential model for building the network. In the Sequential model, we can just stack up layers by adding the desired layer one by one. We use the Dense layer, also called fully connected layer since we are building a feedforward network in which all the neurons from one layer are connected to the neurons in the previous layer. Apart from the Dense layer, we add the ReLU activation function which is required to introduce non-linearity to the model. This will help the network learn non-linear decision boundaries. The last layer is a softmax layer as it is a multiclass classification problem. For binary classification, we can use sigmoid. In this step, we configure the optimizer to be rmsprop. We also specify the loss type which is categorical cross entropy which is used for multiclass classification. We also specify the metrics ( accuracy in this case ) which we want to track during the training process. You can also try using any other optimizer such as adam or SGD. The network is ready to get trained. This is done using the fit() function in Keras. We specify the number of epochs as 20. This means that the whole dataset will be fed to the network 20 times. We will be using the test data for validation. We check the performance on the whole test data using the evaluate() method. The results look good. However, we would want to have another look at the results. The fit() function returns a history object which has a dictionary of all the metrics which were required to be tracked during training. We can use the data in the history object to plot the loss and accuracy curves to check how the training process went. Let us plot the loss and accuracy curves. 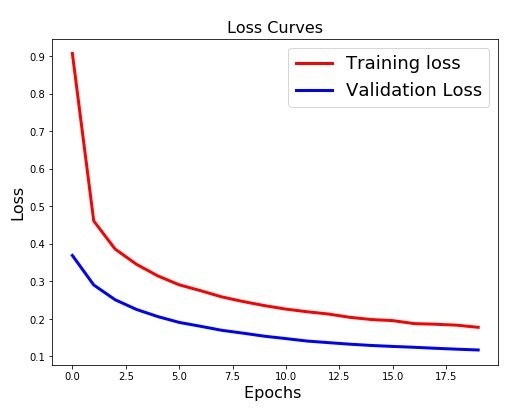 Although the accuracy obtained above is very good, if you see the loss and accuracy curves in the above figures, you’ll notice that the validation loss initially decrease, but then it starts increasing gradually. Also, there is a substantial difference between the training and test accuracy. 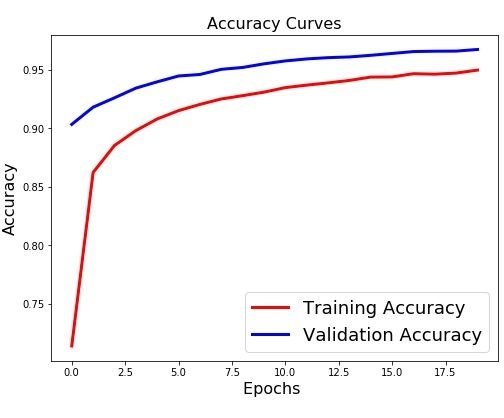 This is a clear sign of Overfitting which means that the network has memorized the training data very well, but is not guaranteed to work on unseen data. Thus, the difference in the training and test accuracy. Overfitting occurs mainly because the network parameters are getting too biased towards the training data. We can add a dropout layer to overcome this problem to a certain extent. In case of dropout, a fraction of neurons is randomly turned off during the training process, reducing the dependency on the training set by some amount. We will train the network again in the same way we did earlier and check the loss and accuracy curves. Thus, we can say that the model has better generalization capability as the performance does not decrease drastically in case of unseen data also. We have seen that the first image in the test set is the number 7. Let us see what the model predicts. During the inference stage, it might be sufficient to know the class of the input data. It can be done as follows. In the above method there is no score which tells us about the confidence with which the model does the prediction. In some cases, for example when there are many classes, we may want the probabilities of the different classes which indicates how confident the model is about the occurence of a particular class. We can take the decision based on these scores. This gives the probability score for each class. We can see that the score for the 8th index is almost 1 which indicates that the predicted class is 7 with a confidence score of 1. We had used 2 hidden layers and relu activation. Try to change the number of hidden layer and the activation to tanh or sigmoid and see what happens. Also change the dropout ratio and check the performance. Although the performance is pretty impressive with this model, we will see how to improve it further using a Convolutional Neural Network in the next post. Stay tuned! If you liked this article and would like to download code and example images used in this post, please subscribe to our newsletter. You will also receive a free Computer Vision Resource Guide. In our newsletter, we share OpenCV tutorials and examples written in C++/Python, and Computer Vision and Machine Learning algorithms and news. It is there somethong I am missing? or don’t understanding? I think you have not downloaded the code and copied the code from here. with the use of %matplotlib inline appears an error that I can not solve. Great article, Satya. I’m enjoying your content! I used the code from this tutorial on my own data to train a model that classified juggling patterns. This works incredibly well! Any advice for preprocessing the data? Thanks! Which code did you use? The first 60 lines load the data. Each class of data is stored in a separate folder. A lot more tedious than minst.load_data(). I wrote lots of other code to detect the features, generate images of feature trails, and display results. I want to know how to save the model and use it for inference alone. Because until now all the tutorials uses the model after training, so if i want to try different samples in inference i just have to re-train again and again. So i was wondering if you can include this part in the next tutorial. Thank you so much for the nice tutorials. You can just save the model using model.save() function. You can have a look at [this](https://www.learnopencv.com/keras-tutorial-fine-tuning-using-pre-trained-models/) tutorial for the use case. Thanks for your reply. I found it yes. Great article. It is possible that i can use your figure: keras work flow for training in an article or how i can cite you for this article that i am writting?, thanks a lot. Yes you can use it. Just give a link to this page for citation. thanks, great article man !. https://uploads.disquscdn.com/images/5ac16301c776ae62ec2b74ecca338be93d8af63507d3751260ab63ea7a9fe423.jpg https://uploads.disquscdn.com/images/cf3f1c8a831a02c1ce48aa5da536e697a9796fcfcc323443b8a5356591fe754e.jpg Hey! Thank You a neat and precise article. Can the test accuracy ever be greater than training accuracy.? val_loss: 0.1173 – val_acc: 0.9674. What should i infer from this ? May I just say, this is the best article I have seen in my life !